GLC300 run flat thread wear problem. I replaced my 19" Scorpion Verdes in late May at 4500 miles due to poor ride quality. After a lot of shopping, I bought non-run-flat Goodyear Assurance WeatherReadys and picked up an inflator and slime kit for $25. The Goodyears are awesome. These tires feel slightly softer than the Pirellis in my opinion. The handling is as good as it was before if not better, but I can tell they are slightly softer in the sidewall. The most important thing is that they have none of the harshness and noise that made the car ride so poorly on the Pirellis. And they are highly rated for rain, snow, and ice which is important for me. Bottom line, I'm glad I did this. The car rides and drives so much better, it is now more like what I was expecting for my first ever MB product. Even better, my local Goodyear store beat the Tire Rack price by $19 per tire and installed them for free with free lifetime rotations. Buy local. Last edited by mtberman; 07-24-2018 at 04:11 PM. One of my 4 is losing tread fast and I am only at 14K and the rest are not much better. Found a spare kit and it fits fully under my storage door so NON runflats for me! Anyone have experience with Vredestein Quadtrac 5s? The Vredestein Quadtrac 5 was a top three choice for me. I opted for another tire for two reasons: This tire tested a bit noisier than others, and more importantly (as another person already said) the Vredestein brand is not readily available everywhere in the US. The tires themselves are highly rated and are less expensive than other choices, but I didn't want to risk having another noisy tire, or with potential delays if I ever need a replacement. It is a great tire, however. I would be interested to hear if anyone has tried these on their GLC. These Quarac 5 tyres are being fitted by MB UK to GLC to fix tyre crabbing. I do not think they are runflats. Responses from UK drivers have been very positive since Feb 2017. The company is Dutch based from memory, over 100 years in the industry and respected. Was sold to Indian company around 10 years ?? Ago, still with Europe management. Not sold yet in Australia due to small market and multiple sellers supporting over 70 car brands with dozens of model variants in each brand. Only 26 million people, not all of driving age to buy into the 70 Brands. If they come here I would seriously consider purchasing these tyres. I agree with the run flat tire issue on the GLC300. I have had 2 GLCs (2017 and 2018) and 3 sets of tires (2 Pirellis and one Continental RF) - Got 20000-25000 miles on all 3 sets which is not too good. These are the only 2 RF tires for the GLC unfortunately. I know some people go to non run flats where you can get a 50000+ mile tread ware warranty and I would assume you could get at least 40000 miles on them. Hopefully there will be better run flats soon like the Bridgestone Driveguard! DriveGuards are what we're running on our 2016 GLC. We like them and they have a 60,000 mile wear warranty. We now have over 26,000 miles on them and they're looking good. Just curious are your Driveguard run flats? 18"? the worst part about the tire MB chose is as jjt1234 stated - there are only 2 choices for RFT in the 18" size. while RFT on the GLC is disliked by many, it would not be as bad if we actually had a more than 2 RFT options to choose from. Hopefully there will be more tires to choose from soon especially since Mercedes is selling about 50,000 GLCs a year in the u.s.
Great thread, my run flats (GLC300) have about 9.5k miles and seem at least 60% worn. I just got the car and the dealer said they rotated the tires. The rears are significantly more worn than the fronts. Is it common to have fronts wear faster than rear? I am thinking they must have been rotated by someone else and the dealer did it again. i dont know about the GLC specifically, but tires on other vehicles i have owned have typically worn faster in the front than the back. From experience with my GLC300 and a GLA250 - both with runflats/runonflat - it's important to rotate the tires every 6K miles or so. I think the tire was ~$120 and the jack kit around $100, both unused. 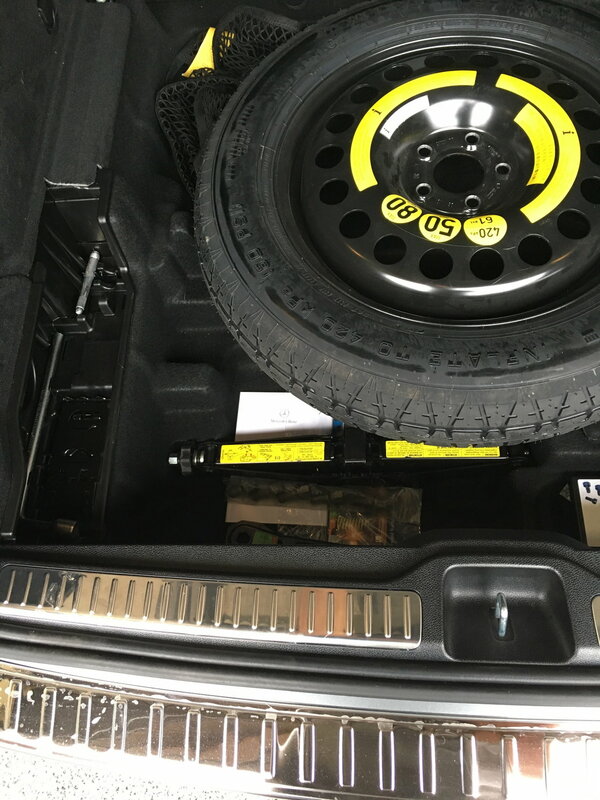 Everything fits out of sight in the rear storage area under the carpeted floor/cover (whatever it's called). Last edited by brady; 02-06-2019 at 04:54 PM. where did you buy the tire and wheel and where did you but the jack kit? 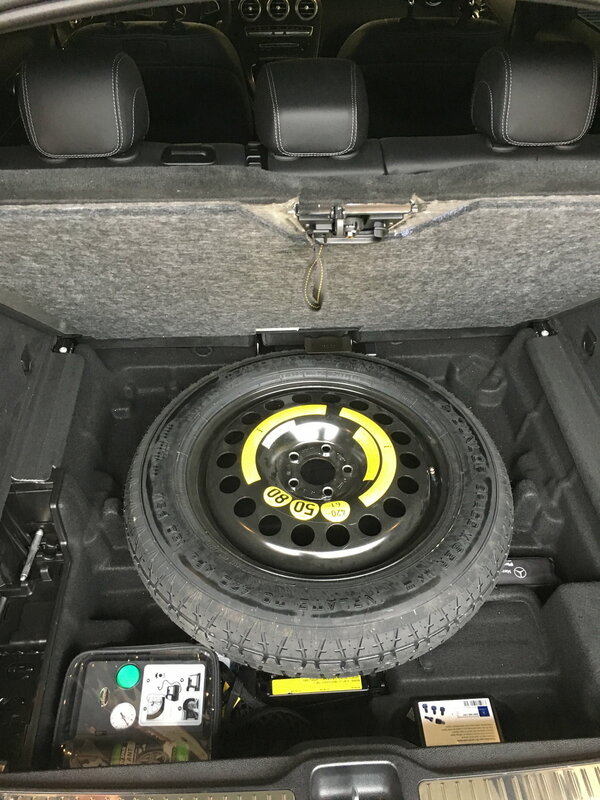 Bought the tire and jack kit off of Ebay. Both were unused from wrecked/scrapped cars. The jack is stored right below the tire in the 2nd image and the other goodies are off to the left. Last edited by brady; 02-06-2019 at 04:51 PM. Ours OEM's wore evenly and were trash at 19,000 miles. did you rotate? i am none to happy that rotation isnt part of the A or B service which are basically expensive oil changes, i have yet to rotate but wear seems even front and back. I rotate mine every 6000 miles. Need to do that to get a little more mileage out of them! I have the tires on all of our vehicles rotated and re-balanced every 5,000 miles. I am having the same issues and have been fighting Mercedes for 3 years and they refuse to do anything about it. I am on my third set of tires and even the tire companies clearly outline that there is excessive wear and tear in the tires. Mercedes just turns a blind eye and says that is normal. This car has major issues and when I hit uneven road the car sways in the back causing the tires to take the impact and stabilize the car. Stay away from the GLC300.. it is a mess. This is balding on my tires with only 9000 miles on them. Ridiculous. I have done alignments, the tires pressure is perfect. I got a brand new 2016 GLC 300 6months ago. Put 15k miles it. 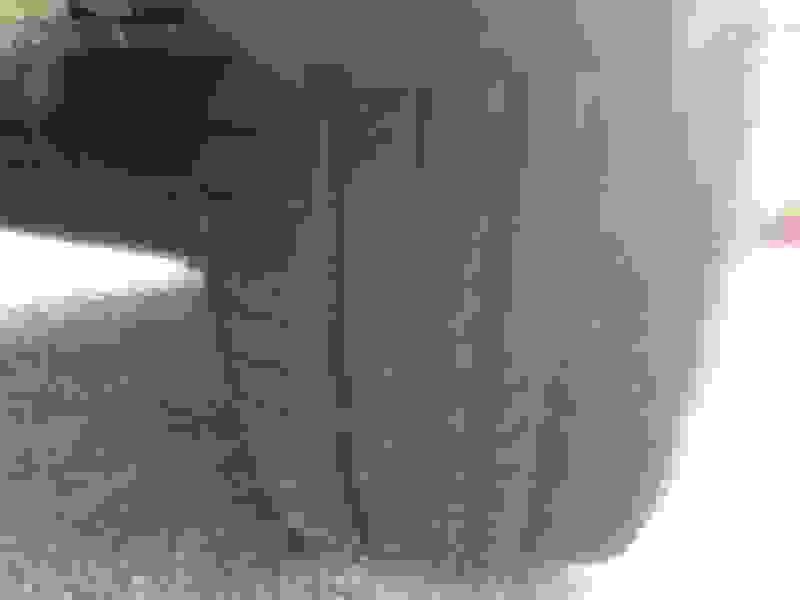 Run flat tires are completely bald. Was previous owner of 2 BMW all with run flats also. Those usually went for about 22-25k miles before I had to replace. The Pirelli OEM run flats on the MB GLC are terrible. Called dealer, they mentioned some customers run flats on GLC start balding at 12-14k miles. Mine at 15k are bare as a baby's bottom. Going with regular tires and a spare. Outside my issue with the terrible run flat tires, this car is AWESOME. Best car I have owned so far. Super quiet, roomy and comfy. Great power. Awesome sport and sport+ driving modes. I have a 2016 GLC 300 with 15,000 miles on it. Still have the original tires on it. They actually still have tread on them. I have rotated them regularly. I have also had the vehicle realigned which was pricey due to the fact that the car has the advanced driving package on it. At 33,000 thousand miles replaced the oe Pirelli tires on my GLC. They were ok but mostly dissatisfied with how quickly they wore out. Currently running Bridgestone Driveguards, Much better ride and much less noise. All in all, much superior tire. Encouraging to note they come with a 60,000 mile tread life warranty. We'll see. Last edited by larrypmyers; 03-12-2019 at 08:57 PM. Sorry for the off-topic, where can I get that trunk lid protector for my GLC? It's not listed in Mercedes website under accessories.